Holy Communion Sunday, 3rd March, 11.30am, all welcome. Ignite Youth Group meeting Friday 1st and Friday 15th March, 7.30pm at the church. Sunday 10th February, we welcome Very Rev Trevor Morrow, to lead the service with Helen. World Day of Prayer Service, Friday 8th March, 7.30pm. All welcome for a time of sharing and prayer. Sybilla and other church members are organising this time of service and prayer, please speak to them for more details or to get involved. Church Council Meeting, Thursday 14th March, 7.30pm at the church. Sunday 17th March, St. Patrick’s Day Celebration, Faith on the Move! Come and join us for a family service of worship, 3pm. Sunday 31st March, we welcome Mr. Theo Bolaji Douglas (Lay Preacher Presbyterian Church in Ireland) to lead the service. Sunday 31st March, Student gathering after the service. Church Council Election in March. Nominations will take place of suitable candidates on Sunday 3rd and Sunday 10th March. Voting slips will then be allocated, voting forms can be returned on Sunday 24th and Sunday 31st March. More Church News to follow during the month. 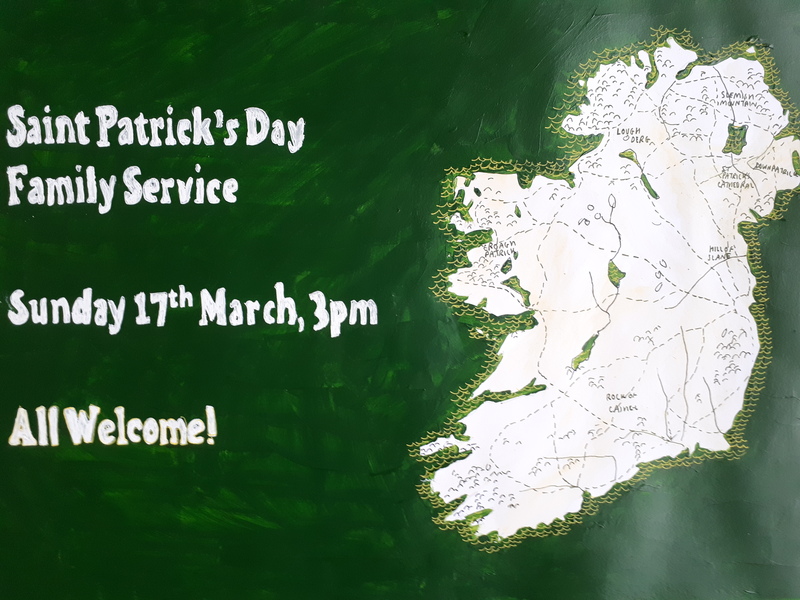 St Patrick’s Day Service, Sunday 17th March 2019 at 3pm, see you there! Holy Communion Easter Day Service , Sunday 1st April, all welcome. Sunday 8th April, we welcome the Methodist Lay Preacher Mr. Chris Forsyth. Local Group Gatherings for Knocknacarra, Wednesday 11th April, at Jeanette and Vincent’s, 7.30pm. For Clarinbridge area, Wednesday 25th April, at Maeve’s house, 7.30pm. Ignite Youth Group Big Weekend – 13th – 15th April. Please contact Ruth if have any queries. Ignite Youth Group, Friday 20th April, 7.30pm. Sunday 15th April , we welcome Presbyterian Lay Preacher, Mr. Theo Bolaji. Church Council Planning Meeting, Wednesday 18th April, 7.30pm at the church. Church in Chains Galway BBQ. Holy Communion Family Service, Sunday 30 ​August. Ignite Youth Group (all teenagers welcome) meeting Friday 4​ and 18​ September (the first and third Fridays of the month). Sunday 6 ​September, we welcome Mr. Werner Van den Hemel, accredited preacher with the Presbyterian Church, to lead the service. Sunday 13 ​September, we welcome Rev. Peter Berrill to lead the service. Church Council meeting, September 17​7.30pm at the church. Life Group (Bible Study), 7.30pm – 9pm, starting back Wednesday 23​September, at the church. Student Hour English Class, starting back Friday 25 ​September, 6pm ­7pm at the church flat. ‘C​hurch in Chains’ C​onference, Saturday 12th September, at Athlone Springs Hotel, 11am ­ 4pm. For more information talk to Ajoy and Chitra. Harvest Thanksgiving Service, Sunday 27 ​September. Kids Big Day Out, Saturday 10​October, trip to Dundrum Methodist Church. Please let Sybilla or Ruth know if you hope to attend. “Making Connections” Multi­ Ethnic Conference, Saturday October 3​, please sign up on the sheet on the announcement board if you can attend. It’ll be a great day. More information on the announcement board. Praise Group meets for practice every Saturday from 6pm ­ 7pm at the church, all are welcome. Open Door ­ the church is open from 12 ­ 3pm, Thursdays, Fridays and Saturdays for coffee, prayer and chat. New helpers always welcomed. 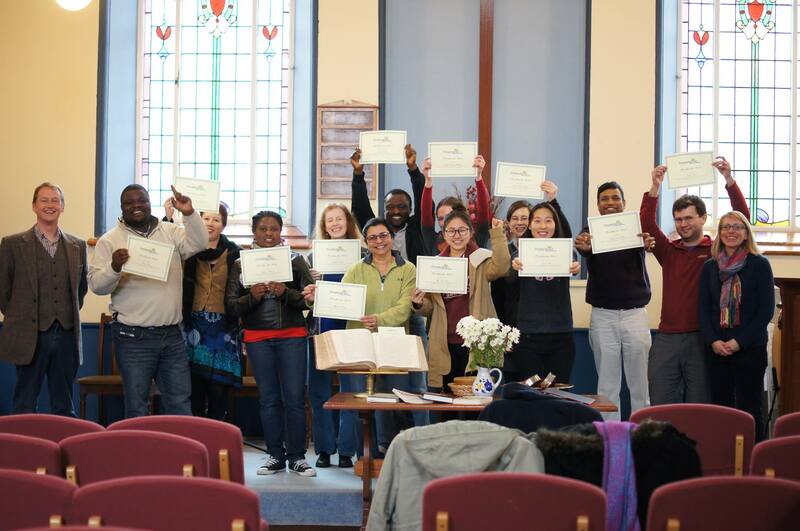 Well done to all the Handling the Word participants, who successfully completed the course on Saturday… Thanks to Lorraine Kennedy Ritchie and William Hayes for their teaching and to the participants… great course and great being together… To God be the Glory!